MEGA64 PODCAST 301 ROSE ON THE THIRD DAY!! "Better late than never." The classic quote said to Christ as he walked out of the cave on Easter sunday night (he was supposed to bounce that morning). The same can be said about our recorded podcast, now available. In this episode, the gang talks about PAX East, The Stanley Parable, the Atheist's Nightmare, Deception 4, and karaoke incidents. Check it out below, or listen to the audio version here. 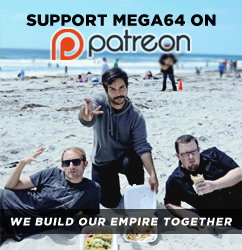 Keep your eyes peeled- this week is going to be a CRAZY week for Mega64 fans. You are... not going to believe some of the things you see. And just when you think it's over... it isn't. Remember- support the show and pick up a Company Hoodie today. Bundle up. It's gonna be a rough one.